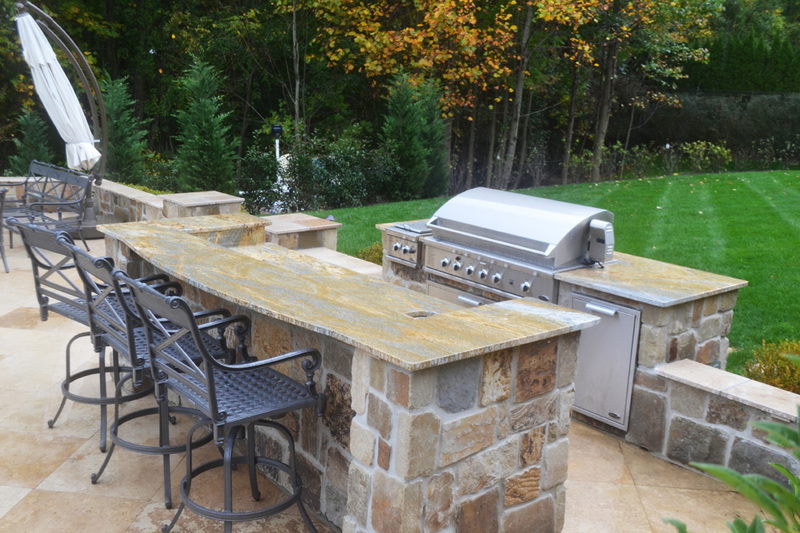 An outdoor kitchen built of natural stone with granite countertops is the perfect addition to finish an outdoor entertaining space. Photo courtesy of RTK Design Group. Natural stone is durable, readily available, and comes in a variety of textures and colors. No wonder it’s considered a darling among landscape architects and designers. 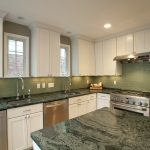 For these reasons, and more, they often turn to natural stone when creating their designs, even when they have a wide range of materials at their disposal to use. We dug deeper and asked three experts to share with us how and why they turn to natural stone for their projects. Some of the reasons might surprise you. 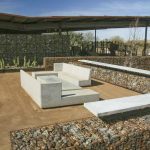 “Great design is often centered around the structures and patterns created by elements like stone work,” says Robert Kaye, landscape architect and owner of New Jersey-based RTK Design Group. Kaye has spent the last 35 years working in all aspects of landscape design and construction, including teaching in academia. This outdoor fireplace was built of natural stone, decorated with a travertine mosaic inlay to create a one-of-a-kind look. Photo courtesy of RTK Design Group. Stone’s heft taps into our need to feel grounded and safe. Jan Johnsen, co-principal of Johnsen Landscapes & Pools, works primarily with clients on the East Coast and has more than 30 years of experience in landscape design and building. She appreciates stone for its useful durability, adding that part of its appeal is that stone is a steadying, grounding force in a landscape. She often uses the material for its rustic beauty and ability to be molded into many things, from a solitary garden feature to a mosaic wall or quiet dry stream. Larry Cavender, ASLA, a landscape architect based in Portland, Oregon, often uses natural boulders in his projects because they’re great at handling grade changes in the garden. “Well-placed boulders create interest and strength that no other material can match,” he says. Unlike other building materials that have to be fabricated or produced using harsh chemicals, natural stone is abundant in quantity, bountiful in colors and designs, and eco-friendly. “Natural stone, as its name expresses, is just that: acquired from nature,” notes Kaye. 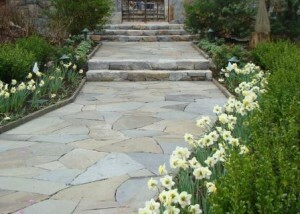 Stone paving set in a random pattern makes a great garden walk. Here it is bordered by low bluestone edging. Design and installation by Jan Johnsen, Johnsen Landscapes & Pools. For clients who want the best possible way to achieve an authentic, rich look, natural stone is the way to go. Cavender’s local stone yards and quarries offer a diversity and richness in stone products that allows him to choose materials which complement other landscape and architectural features within the garden. Since there is a range of natural stone options, from local quarries to international sources, it can also be as affordable or extravagant to meet different kinds of budgets and looks. The beauty that natural stone affords in projects is that the material is beautiful and can be used in so many different ways to create texture and interest. Sometimes finding that perfect stone can make the space come alive. Curving grass steps add an elegant accent to a sloping garden. Belgian Block act as the step risers. Design and installation by Jan Johnsen, Johnsen Landscapes & Pools. Johnsen often finds tall vertical stones in her local stone yard that she enjoys using as accents in her projects, such as standing stones in a garden. 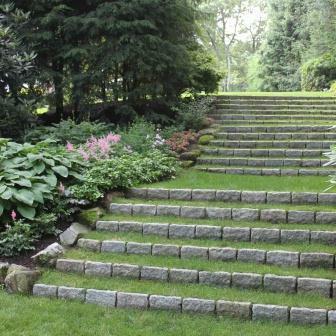 She often uses stone to create garden steps because it makes the journey through the garden a special experience. “I love to use stone – granite pavers, Belgian blocks, or bluestone – as the risers in grass steps,” Johnsen adds. Cavender appreciates how natural stone can be an interesting counterpoint or contrast to more refined landscape elements, creating an interesting tension within the landscape. 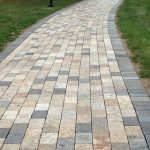 An overriding theme among our experts on why they love using natural stone in their landscape design projects is it often allows artistic liberties unlike other types of materials or treatments available in the marketplace. From walls and flooring to water and garden features, natural stone allows a homeowner and designer the opportunity to experiment with using different types of stones within the landscape in unique ways. 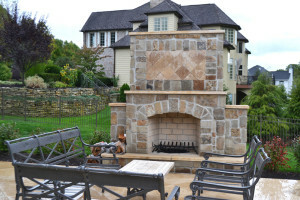 Not only is natural stone beautiful, accessible and versatile for landscape projects, but “stone is a premium material and brings a higher value to the overall project,” adds Cavender. He and his client also like the fact that it’s a natural material that makes a strong connection back to nature. From its ability to be formed into different shapes and sizes to being aesthetically appealing, landscape architects and designers also appreciate the range of offerings, both in regards to stone variety and the wide range of price points that natural stone provides. Regardless of the type or price of the material used, natural stone enriches the design.